This evening as I was leaving Best Buy, I noticed this man going through the garbage can outside of the store. As I walked to my car I watched him as he reached in the garbage can and pulled out fast food trash bags and inspected all that was in the thrown away bags. He did this for several minutes. He would find a few fries in one bag and a bite or two of a hamburger in another bag. You can see the hamburger wrapper by his knee where he was placing the food items he’d found. He never bothered anyone or tried to stop and beg for money as people entered and left the store. After he went through the entire trash can he neatly cleaned up the area and wrapped up the food he found in the dirty hamburger wrapper. My heart literally hurt for him. I am not someone who just hands out money or even helps homeless people because so many are not truly homeless. I don’t guess I’ve ever seen someone actually go through a garbage can to try to find food to eat. I knew I had to help him. I got out of my car and asked him if I could buy him something to eat. He told me he would appreciate anything I could get him. He was on a bike and I told him if he’d follow me I’d buy him a meal at the fast food place around the block. He followed me and I bought him the biggest meal they had on the menu. The only request he gave me for his order was if I could get him a big glass of sweet tea to go with his meal! When I brought him his food, he was so thankful. He told me his name was Steve and he’d been homeless ever since his sister died last September. He was trying to get off the streets, but it was so hard. I told him God loved him and I would pray for him. He told me again how much he appreciated the meal. When I got back in my car, I drove off with such a heaviness in my heart for this man. 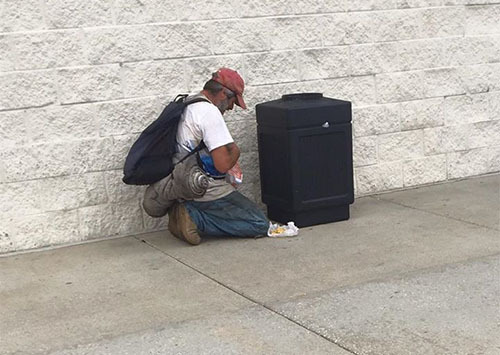 I drove down the road and felt compelled to go back to help this man. When I came back he had finished his meal and was riding away. I pulled up beside him and asked him if there was any way I could help him. He told me not really. He never asked me for money. I asked him if I could buy him a few meals and put it on a gift card for him. He told me that would be so kind. I drove to McDonalds and bought him some meals and gave him a gift card. He said, “You see, I have cancer!” He pulled up his shirt and pointed to a huge mass that was poking out from his stomach. He said said he knew it wouldn’t be much longer. I asked him if knew Jesus. He told me that he did. I asked if I could pray for him and he said that I could. We prayed right there on the sidewalk of McDonalds. Tears just poured from his eyes. He told me he knew that he was going to die and that he was ready to die. He was tired of being in pain and he would be better off dead because this was no life – living this way. I stayed and encouraged him for a few minutes trying to fight back my tears. My prayer is that I showed him the love of Jesus today… that something I said gave him a hope. You see, everybody has a story! I know Steve’s story now… all because I felt compelled to help him… he ended up touching me today! When I left him, I knew I had done what God wanted me to do! God put him in my path today… I know he did! I’ve never felt such a feeling to help someone as I did today. I was reminded again of how blessed I am! I have a vehicle that gets me from place to place, I have a roof over my head, clean clothes, money to buy a hot meal, running water, electricity, my health, a job, family, and friends! Sometimes God sends situations our way to remind us of how blessed we are! If you’ve read this far, please remember Steve in your prayers! Yes, I have been blessed, God’s so good to me! Precious are His thoughts of you and me! There’s no way I could count them, there’s not enough time, so I’ll just thank Him for being so kind. God has been good, so good! I have been blessed! The feeling with which you have described the entire meeting and the you going back to help Steve further truly speaks of a miracle and the power of prayers. Salute to you John! People these days think twice, if not more than that before going out of their way to help. God Bless you and Steven for sharing. I cry while reading such a beautiful story, thank you for sharing it with us. Thank you for sharing this story. I couldn’t help the tears in my eyes as I read this. So often we turn our backs to beggars without considering what Jesus had commissioned us to do. So often we get judgmental on these people and refuse to give even a dollar which we can afford. And so often we criticize and complain about the many things we have been blessed with instead of thanking God. Being truly inspired by this story, i will make it a habit not to turn my back to anyone who comes to ask, especially the people on the streets. Oh what a touching story I pray God heals him. I pray that the Holy Ghost falls upon him The precious blood of JESUS pours Steve’s blood away and flows in his bone and marrow. Amen. We never know when or how are next lesson in life will show itself. How awesome you took his situation and saw it as a lesson for you. What a wonderful man Steve is and must be one of Gods angels. Bless him and you! Thank you for sharing!!!! Thank you so much for your post. Its great to atleast know that Christ’s love is still working through us. God bless you mightily for helping Steve.I’ll pray for Steve too. Very touching story. God bless u. Keep on helping others. Jesus (God in Flesh) taught mankind this kind of love! Great in deed!! I am new to this site didnt know existed. Yes. Our Lord Jesus’ words say we will always live with the poor. Its how we respond to the needy that makes the difference. But mostly define our faith and joy in The Almighty Lord God we believe. Yes such is the display of JESUS’ LOVE for us all. Bless you brother. But glory be to our Heavenly Father for using you. It’s been a while since I read such a beautiful touching ,story thanks ! Ooh poor Steve… He has really inspired me with these words he said..
“I know am going to die and am ready to die”.. I wish I could say that boldly to myself and the people around me the same sentence”… may God bless and keep u Steve.. if its not the will of our Father in Heaven to let this cancer take away your life, may HE heal You and strengthen you in Jesus Name Amen. John you have a place in heaven what a beautiful soul. As for Steve I will never understand why he has to go through all that suffering. The Pope yesterday when he was in United states he was talking about the homeless. I wish these people have somewhere to stay warm place and food. May God bless them. Yesterday I watched CNN and the POPE Frances visit U.S he talked about the homeless and he ate dinner with them. John you did the same now i wish that steve will have all the help he needs especialy somewhere to be warm and i wish him well and the Government helps all these homeless people. John you have a place in Heaven and Steve may you keep on finding warm hearts like John. This story was sad but it touched our hearts Dulce wanted to cry. So touching! I’m glad I can at least be sure of my next meal, by His grace. Truly God cares. This is very touching and i am greatly encouraged. Keep it up John and continue with the same spirit, that is your ministry. We all need to be reminded how lucky we are sometime…..thank you for sharing such a heartfelt story….God Bless you Mr. Brantley …. so blessed. I need to count my blessings more often and thank God for them. You are truly the good Samaritan. If only we would always listen to the Holy Spirit. To live like Christ!! Congrats John Brantley for what you did. It is a very real touching history. Read Matthew 25:31-46. I hope you will be in a good side at the judgement day. May GOD bless you. Wow so true, very touching. These feelings of giving happiness can not be expressed in words. That cancer patient reminds me of my cancer. Since two years i am in this blood cancer disease , but the beautiful living soul , loving Jesus has never let me down, in all my pains he is there, like a protection shield. Thank you lord for your love. Such grt act of tis writer must be learn by every one.nothing is there in this life. Helping someone, listening to god’s voice and being good is what needed in this world. Thank q for such a beautiful story. God is everywhere, in everybody’s heart. The humble experience you have shared sir, it proves the existence of God. Thank you sir. It is really a heart touching story to human race. Awesome Testimony brother! Just today I was wondering am I even still subscribed to this site, I mean I love the stories, but there was something inside me questioning what is so special about this site, why do I feel this urge to stay subscribed to this particular site while generally I dont do this sort of stuff, npw I am certainly sure that God loves this website himself, and I am blessed by this website, God bless you brother! Thank you for such a heartfelt story on the day of the Lord, Sunday, September 20, 2015, John. God has a strange way of putting people on this earth and we do not know who we will encounter and how it will affect our being. Praying with someone, sharing a meal, caring for a stranger, this is a good samaritan act. It made me feel good to read your story and noticed that you are a Principal of a school. I hope that you will share this story to other administrators, supervisors and students that THIS is one great lesson. There are so many Steves on a street, let’s pray for those Steves. Very touching story. Thank Allah for blessing. Motivation could likely be learned from others’ experience, this one included. Thanks a lot sharing.